Interface design: what's it all about? I have produced a fair number of websites and interfaces in my career as a researcher, lecturer, developer and now Learning Technologist. It's an exciting process and I'm sure many interface designers will agree with the excitement of deploying a huge range of content, ideas and approaches to their final output. So I thought I would share some of my thought process on what to expect. It goes without saying that content for teaching materials is vital! However, when it comes to design of the interface itself, all suggestions have to be taken into consideration, sensibly. For me a good designer takes the ideas from the client on-board and then sympathetically feeds back the disadvantages or benefits of those ideas, describing how they will best fit. The designer then goes away, researches, experiments with the concepts and content, thinking about how this affects the interface, make the necessary sympathetic tweaks to produce a final draft for their clients to view. There are of course times when content and interface are happening simultaneously, the positive is that the designer can help keep some consistency with the process as it unfolds. It's all about the content...where is it? On the topic of content (teaching materials), I often hear myself saying this to a lot to clients, "its all about the content" as we cannot built an effective interface without having or know what the content will be. There is also often a misconception that providing teaching content is easy. Scribble some ideas on a piece of paper and knock it all together on a computer, then throw in all the content "...it's the digital age, practically automatic these day..."...not really, its just a different approach to packaging content. We have to have a holistic grasp of appropriate electronic media and software, as well as the pedagogic. We may have to deploy different programming languages, building from scratch; or if we are lucky off the shelf packages that 'may' have some flexibility to allow for good design acumen. Granted there are some technological short cuts, but in reality it's a lot of hard work and head scratching to do it properly. From a learning technologist perspective, we have to think on many levels, its actually a project managing affair in its own right. After all, the interface is the pivotal source of information, if this does not work properly, how will anyone use the materials efficiently? I find the juggling act really starts in the later stages, when sharing the final drafts of the design with the clients. There is often excitement and with this comes the clients need to bolt on some last minute additions to feel part of the final design. It's an unusual situation, of flattery combined with some stomach churning anguish regarding how it could affect the final design. What we have to be careful with at this point is that we are not damaging the original design concepts (which you have likely spent months researching), there is good reason for this. It's vital to maintain consistency in our design, ensuring that the final product does not end up like a 'Mardi Gras of content': very colourful, all singing and dancing but the end user is lost in the colours and noise. This is by no means to say that those ideas are daft or inappropriate, it is purely a case of establishing if they will all make comfortable bed fellows. The designer has to ensure that all the ideas and content flow together as coherently as possible, sometimes at the expense of loosing some of the clients inputs, but with the hope there are no red faces along the way. This is particularly important if the interface forms part of a wider 'identity' (be it corporate or educational). Does the client already have other websites, or existing teaching materials elsewhere, do they share some commonality, does the existing content need to be re-purposed? These all affect final designs. Sometime you have to use a pre-designed learning environment with very poor customisation tools or loads of 'lock-downs', in those cases you have to make do, it's up to us to intelligently add content and design ideas to somewhat match the complete vision. What about the learning experiences? Each part of a learning experience has to fit the intended audience, such as accessibility (can it be used with screen readers, will it be accessible in specific operating systems or software environments) and the usability, what about cross platform comparability, will the users actually be able to work with this interface in the way it was intended. Will the interface become a barrier to learning? Will any students be disadvantaged if certain functionality is unavailable to them? How will the different forms of formative study provide the grounding for their summative projects? The list goes on, it's not always easy to second guess the anticipated student use of such a system. As we are essentially educational developers with technology 'plug-ins', we have to pull from both pedagogic and technological approaches to create the best learning environment. A lot of the initial designs can be used by studying other systems, researching pedagogic research papers on learning environments and of course the all important, student trials. This is probably the most important icing on the cake for learning technologists, try your interface with a small sample audience. See how it fairs... fingers crossed. Today we finished packaging the content for the user interface for the Hydrographic Academy trial students, ready for posting out first thing in the morning! We've been working right up until Christmas to ensure they are ready and available for the new year. 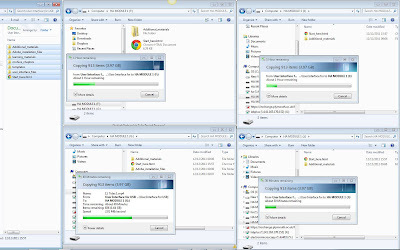 From a technological point of view we had a lot of fun testing how many copy processes we could push through our systems. Pleased to see that the data buses were pretty resilient and we could sit back and watch the data flow while getting on with other work! 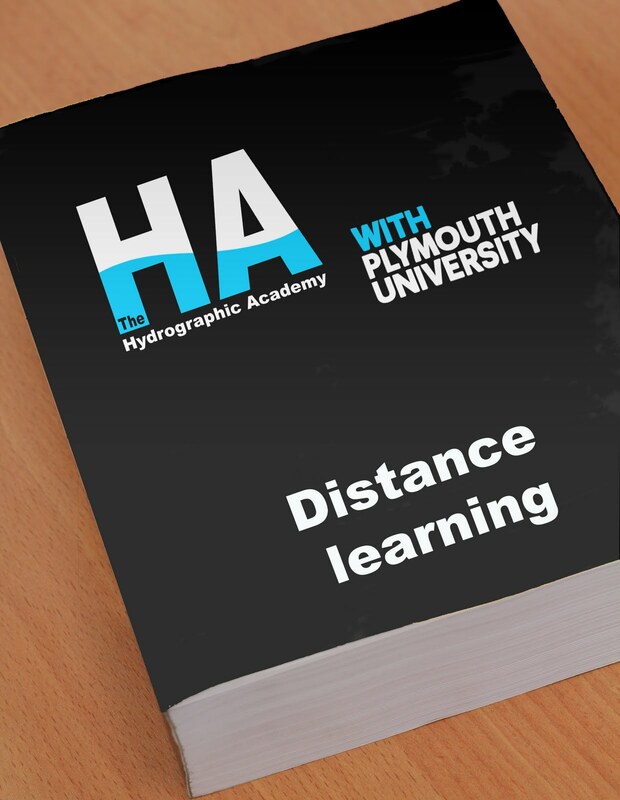 Also see Dr Richard Thain's post on the Hydrographic Academy blog with further information. I finished tweaking the Hydrographic Academy (HA) user interface today YAY! (I confess to a few hours over the weekend too...). Essentially the HA team had a meeting last week to discuss the content and layout of the final, thanks to all for their inputs and suggestions. I'm pleased to say that the final interface has been given the gold seal of approval by the team, so we are all feeling chuffed at completing in time for Christmas. I have to give a big thank you to the HA team, they are a terrific bunch of people to work with, and they have all contributed to making this interface work! Ruth Waring Development Officer for Higher Skills (SW Region) what we had been up too so far. It's a very busy time, I have to confess that the team has been working at full speed for quite some time and we are in the process of finalising the 'offline' bespoke user interface, it's been a bug testing experience but the learning technologist team has been working fantastically to ensure the end user is happy with the final product. The presentation also included some fun animations created by Luke Denner showing the needs of those persons in the Hydrographic industries to learn on the job. There were glimpses of the various elements of the interface the students will see, we were all very pleased with the positive feedback. Thank you to Prof Jim Griffiths (Head of School of Geography, Earth & Environmental Sciences/Associate Dean, School of Geography, Earth and Environmental Sciences (Faculty of Science and Technology)) for introducing the sessions and Donella Bone for organising the meeting so well! Planning Your Video Production - Location planning from JISC Digital Media on Vimeo. I was pleased to see a very structured framework from preparing scripts (storyboards) right through to hiring extra crew. I've yet to do the hiring in extra crew bit, but that certainly is something to consider for bigger productions. We are fortunate here at Plymouth University to have our own media services and some willing fellow Learning Technologists thrown in... However, I would recommend attending a few of these sessions just to get into the mindset of producing films. The above video gives some handy insights and tips, its worth a look! Thank you to Zak Mensah and others at JISC Digital Media for putting this together, I will look forward to similar productions! I have been working on finalising the Mohive interface for the Hydrographic Academy. Taking over from my colleague Becki Vickerstaff to incorporate the HA logo and tweak some colours. 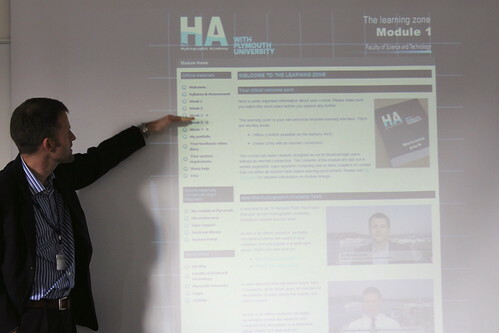 Based on a template designed by Alan Payne from Fugro (UK), we wanted to recreate the theme and colours of the Academy's existing resources, such as the blog that I have developed. Deciding on HA blue for the top and bottom finishers, the top being slightly thicker to compensate for the strong impact of the logo. I think this makes the interface aesthetically pleasing, providing user with a comfortable balance. It is quite important that interfaces are kept relatively neutral so as not to detract from the learning content. The menu system also incorporates the HA blue in the partial and completed icons, as shown. This Mohive interface will house the main teaching and learning elements, the remaining will be housed in a bespoke web browser based interface 'Learning Zone' that Im currently developing. Details of the Learning Zone will be discussed in later posts. I was pleased to be able to attend a very absorbing presentation by the Hydrographic Academy's own retired Lieutenant Commander Tony Jenks. 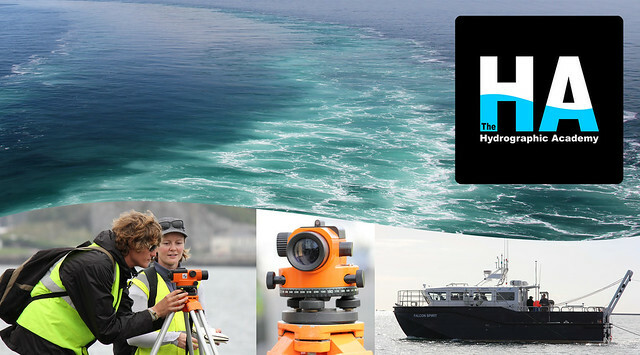 Tony has an amazing background and decades of experience in Hydrographic Surveying. I was really taken aback by the features at the bottom of our oceans. We are literally talking 'Mount Everest' scale features, over 1 mile down from peak to sea surface (never seen until now). Even Grand Canyon style rivers actually flowing! The article I wrote on the HA blog gives a little more insight, I can certainly recommend attending a presentation by Tony, if you see one advertised. 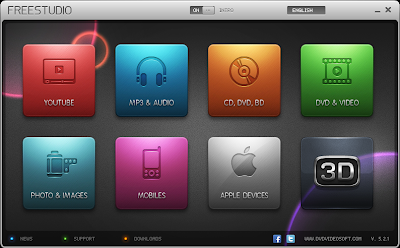 Looking for a decent video, sound or still image file converter? 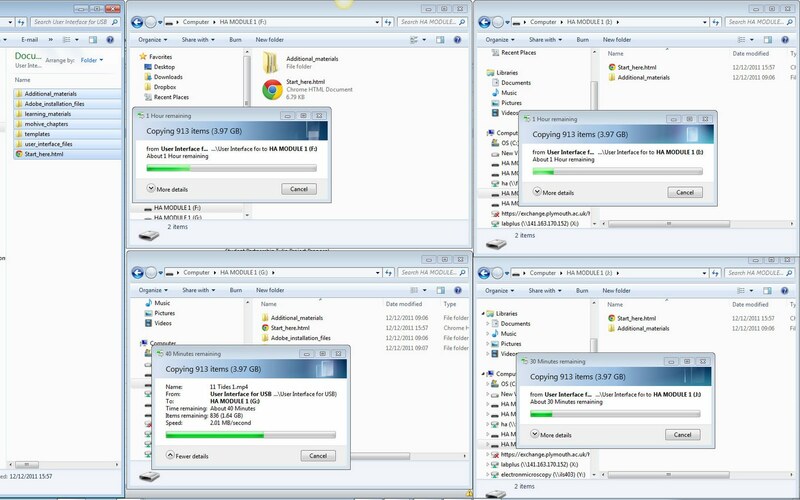 I have been experimenting with a completely free piece of software for the last few months, that actually does a reasonable job of converting (also batch conversions) most video file formats to popular mobile and PC versions. Its called FreeStudio, but why is it free? According to the website they make their money out of advertising from an installation of a navigation bar that appears in your web browsers... However I will point out that it is possible to deselect the install of this web bar in the early stages, and would recommend doing so. When you see the option to install this web bar, ensure you have unchecked from the bottom up, none of them should be selected. If you do forget, it is possible to un-check it from showing in the 'settings' area of your browser. The 'Mobiles' area allows conversion from just about any file format to a format specific to that device. Batches of files can also be converted to a reasonable MP4 video format using for example, the 'video to Android' and selecting a resolution that suited my needs. The options for quality of rendering: economy, standard or high are available. Standard is pretty good for most needs, if you are using a small screen economy is probably good enough for most. So far I can say outputs work great on my HTC android phone using standard quality setting. There is nothing strictly for any video to PC use, although I actually found the MP4s from the mobile conversions worked well on PCs. I think the trick is to use the mobile converters and select an output resolution that is closest to your needs on the PC. It's certainly worth looking through all the various options available, as the programmers have made a big effort to keep the interfaces simple and easy to use. A big thank you to Freestudio for an excellent set of resources. I hope to see many more developments in the future! Thought I would share a collage I created in Adobe Photoshop CS5 to be used in a Marine Institute newsletter for the Hydrographic Academy. The article was written by Tony Jenks our resident retired Royal Navy Lieutenant Commander to share the accomplishments of the Hydrographic Academy team. CampusM has now been released at Plymouth University. It's a mobile application for both Android and iPhone. This was very much a collaborative development project with input from numerous staff across the University. Searching 'Plymouth Uni' within the Android Market is all that is needed! The application is ~1.7Mb installed, so not likely to cause too much of a dent in on board memory. More details on this application can be found on the Technology Enhanced Learning blog post (by Dr Neil Witt). Go to the Twitter resource to create a widget (you need a Twitter account). Right click and copy the URL of this uploaded text file (probably best to ensure this file is ‘read only’ for students! Or hidden). Find and add the web part ‘Content Editor’. Select 'edit web part' then paste the URL link for the txt file from the documents area to the ‘Content Link’ area of the web part (shown top right). It now appears in SharePoint as an active Twitter widget/feed. Know issues are: running script in IE (in general), the user will be asked if it’s safe to run active content – this does not usually happen in other browsers. Annoying but I think most users are used to this now. Worth a look: There are several flavours to the Twitter widget feeds, including the ability to use a keyword search, opening up other opportunities. Thank you to Mark Pannell and Elena Menendez-Alonso for some excellent suggestions to help make this happen. Hydrographic Surveying - 7th October 2011, a set on Flickr. Hydrographic Surveying - 4th October 2011, a set on Flickr. I went down to Plymouth Hoe today with Dr Victor Abbott to take some photographs of his students (Plymouth University) learning land survey techniques. 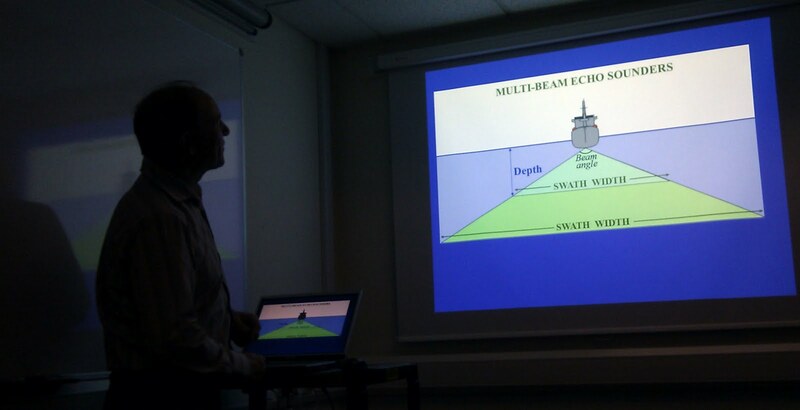 These photos will be used in both the Hydrographic Academy and Dr Abbott's teaching. It was quite clear that all involved were enjoying the experience. Thank you to Dr Abbott and students for allowing me to capture the day. This is a rough route, the Garmin GPS was inside a backpack throughout the day!